You may have noticed that I have played around with the look of the Warm Witty Words website. It’s not finalised yet, but I think it is getting there. The main thing I learned from a recent author event was that ‘I’ am my brand. This got me thinking about using Donna Munro as my brand along with Warm Witty Words. Let me know what you think of my new author logo. There will be lots of changes this year, so make sure you follow this blog to hear more. Exciting developments are coming! For your stories to be read you have to gain an audience. When I was working for a small publisher I marvelled at one author’s resilience trudging from bookstore to bookstore, sometimes barely selling a couple of books (hang on a minute who trudges to a bookstore. I skip with joy. Books, books and more books!). This author was determined to let readers know she was there. Book signings, launches, author talks, radio interviews – anything – she put her hand up to do it. It would have been preferable to be on her bum writing the next book, in fact, some of the events she went to she would have rather had her teeth pulled, but eventually trickles of books began to sell. Soon she had a loyal readership because of her persistence. Anyhow, the reality is that if you write a book you want people to read it. Right? I do. I want to share my stories with as many people as possible. I want them to laugh, cry, giggle, gasp, squirm and feel every emotion I have conveyed on the page. This brings me to author talks. Updated version of the slideshow from our author talk. This could help writers and interest readers who want to understand how writers write. After many years of helping other authors plan them, I finally undertook my own as a published author with my dear friend Katrina MacDonald. We decided we wanted the talk to be engaging as well as about our books and the way we wrote them. An author talk isn’t something you can just turn up to and wing it. There needs to be some preparation to make sure the audience doesn’t yawn, fall asleep or worse, walk out of the room, shooting you a disgusted glare. Katrina, the better public speaker got things started. We’d designed a slideshow together (not as easy as it seems with one, Katrina not me, on dialysis and one, me, working numerous other jobs). We managed to pull it together in time for our author talk. (Please note the main character is the protagonist and the spanner-in-the-works kind of character is an antagonist.) With slideshow clicking through and both of us adding insights and observations the people attending looked engaged and responsive. Though (yes I confess) I was not looking forward to public speaking as I hadn’t done so for a while, it ended up a fun experience. I think having Katrina as a sounding board helped. She’s a pro. I relaxed and so did our audience. They weren’t shy at question time either, asking about our lives as writers. We had a mix of readers and aspiring writers and authors. We had planned the slideshow to engage them all. We also put out questionnaires asking for their email (build your database of readers) for them to go into a lucky draw (a lovely box containing The Zanzibar Moon, bookmarks, coffee cup and candle) which was a pleasant surprise for them. Thank you to our family, friends, readers and new readers and writers who attended and made the event give me a skip in my step instead of trudging home. You’re all awesome. Thank you to those who bought my books too. I hope you thoroughly enjoy them and become part of my tribe of readers as I’m sure you will of Katrina’s when it is released. 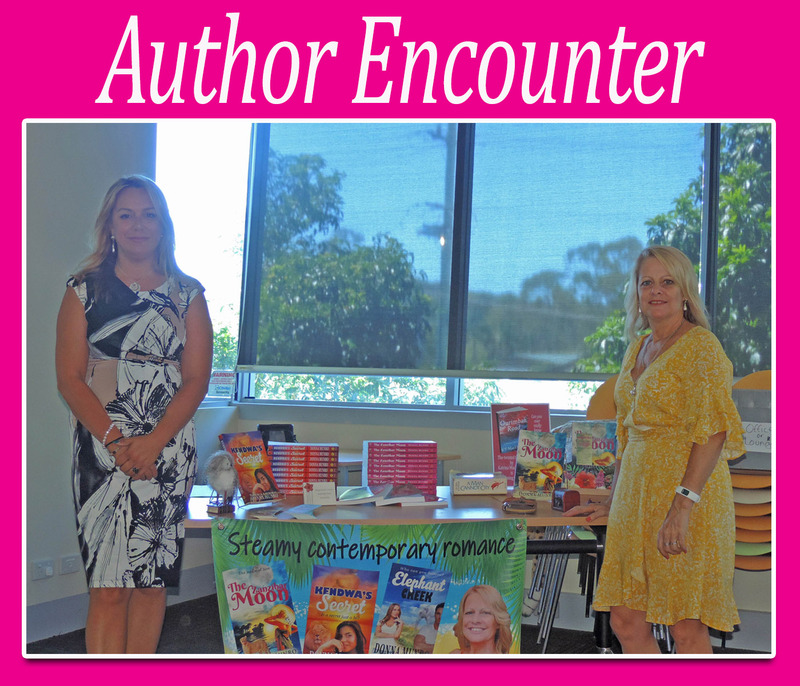 Katrina MacDonald and Donna Munro in front of the display table at the Author Encounter at Elanora Library 18th January 2019. As soon as Katrina’s book Ourimbah Road is launched you’ll be informed here and on the blog she fine-tuning. My own Elephant Creek is also expected sometime this year.